We have plenty of on site parking available including three spots for curbside pick up. Nicolosis catering is your one stop for large party take out, in house events or complete catering at your site. We offer a great selection of our family's recipes for your special event. Nicolosi's has been serving authentic southern Italian cuisine in San Diego for over 65 years. Our old country recipes as well as new favorites have made us a local favorite. 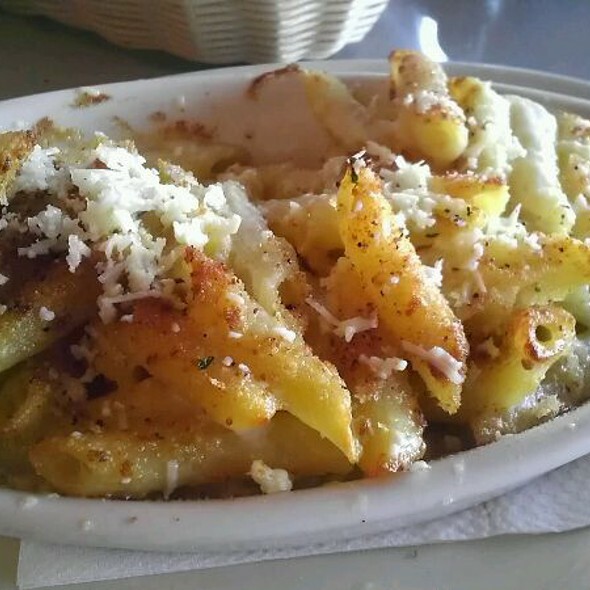 Come try our housemade Lasagna, our hand made Ravioli or our Sicilian Six-Cheese Mac and Cheese. Find out what San Diegans have come to love with our famous torpedo sandwiches, meatballs, awesome pastas and delicious salads. Our pizza has consistently been voted best in San Diego and you can choose from one of our many traditional or unique combinations. A delicious basket of fresh made bread comes with every meal. Our recently remodeled interior, Our welcome atmosphere features attentive service, outside dinning and banquet facilities. Our family hopes to welcome you to Nicolosi's soon. Mangia! We made a reservation and still we waited too long to be seated. It didn’t appear that they had been anticipating a reservation for three, although they had plenty of notice. There was 1 person handling the to go orders, seating guests, answering the phone and cleaning tables. A reservation did us no good. We were seated in the bar as there were no booths available in the section of the restaurant that was open. Not sure why we weren’t able to sit in the other part except that it may have been that there weren’t enough servers. I didn’t see the excellent servers who always used to wait on us when Nicolosis’ was a well oiled machine. It makes me wonder if it has changed ownership. If it has, its not going to last long. Our waitress was harried and curt. After my friend asked for napkins and silverware they were plunked down in front of us. She then asked for a glass for her beer. It arrived with a thud as she slammed it on the table. We didn’t ask her for anything else. The pasta I have ordered so many times before was nothing like it used to be. I ordered linguini with garlic butter sauce. It was a greasy mess. Pizza was passable. Calamari was so uniform and tasteless we wondered if it was calamari or some other fish that had been cut up to look like calamari. It looked and tasted like it came from the frozen food section at 7-11. Nicolosi's has great traditional Italian dishes and pizza. Great food and service. Definitely will return. Only the 2nd time coming here but 1st time using open table . Though the food is good, the service is very slow. It appears that more servers may solve some of the problem. Pizza was great and Ciera was an attentive and very pleasant server. Traditional Italian food. Not always my favorite any more but it is good. Love there food! Service is always on point. Everybody there is very nice. Large menu selection. House made ravioli was excellent. Portion size is on the small side, though adequate. Service was a little slow, waited about 10 minutes to place our order, but then our food was served fairly quickly. Overall very good. It was Valentine's Day so I understand the reason for the wait to be seated (even though we were 30 mins early for our reservation). Then it took almost an hour to get our food after we ordered. The food was good. Service was good, not great. Seemed like a place that is usually better but just understaffed for busy times like Valentine's Day. Nicolosis is my all time favorite restaurant in San Diego. The server was amazing and the food, AMAZING as always. Being Italian, going to nicolosis is always like having dinner with extended family although I'm confident anyone who goes in there will be treated like family and the meal will be almost as great as dinner cooked by Nonna. Which is saying a lot. The food was bland, pasta has no flavor. Sauce is ok.
Love this place with their great food and wonderful outside patio with great view. A good restaurant. The food is good but not exceptional. It’s a good local neighborhood Italian restaurant but not one that is a particular “must see” for visitors. The night we were there, their computer that handles reservations wasn't working very well. So, they didn't have our reservation upon our arrival. We had to wait about 30 minutes before we were seated at our table. The service was slow, but the food was good. All of the staff was very friendly. Great food and service... Our dinner was served piping hot and delicious. Great place to take friends for some Italian and wine/beers! Had to wait 20 minutes after reservation time because there were only two waiters. Service was fairly slow once we were seated, too. Food was decent. Not enough staff. Our waitress was really stretched. They really need an extra person at night. They also ran out of Pinot. Not the best night we have had at this restaurant. We will return again. The salad was great. Pizza was good. I met an old friend here. It is in the old neighborhood I grew up in. There aren’t a lot of places to met in this area. However, I’d go again. Calamari was fried wel and not greasy. The grilled chicken salad was very good. The chicken was tender and not dry and seasoned well. Service very friendly. Bathrooms could use a good cleaning though. I had the meat-lovers pizza there and it was great. Definitely recommend this restaurant to others. The remodel is really nice & the food and Ciara’s service were excellent as usual! We’ll be back soon! Great family restaurant, good value for the amount of food. The food was good, but I wish they served marinara sauce with the gnocchi Parmesan. It was good but way too garlicky. My husband has the calzone and added sausage and pepperoni, again although good, it seemed like the meet was very minimal. Delicious authentic Italian food. Very attentive and friendly service. Our server was great, she was quickly to the table when we were seated; service was quick; food was hot; wine was delicious. Server (sorry i don't remember her name) was personable and was back at the table asking if we needed anything. We never had to ask for water or the check. Fantastic meal and service. I had the Neapolitan Sauce with Angel Hair Pasta, perfection! Nicolosi's has been a family favorite in San Diego for 50+ years with delicious Sicilian style pizzas, torpedo sandwiches, antipasto salads and entrees. Casual, friendly atmosphere, very nice, pleasant staff. Busy during typical lunch and dinner times, so make a reservation with OpenTable. We celebrated our daughters birthday. Had a great a time and good food. Our server was terrific. Not neglectful & not hovering just right. A great place for a family get together. So disappointing... this is a neighborhood restaurant that we have been going to for 20 years. But since the change in ownership it has been disappointing. We hadn't been in a while and we thought lets give it a try again, but no, we will not be back. Hostess said a few minute wait (we arrived early). After 15 minutes and many people sat before us, checked in with her, she said a few minutes again. Then we were seated. Waitress did not greet right away, but eventually made her way to us. We ordered wine, salad and an appetizer. When apps arrived we ordered our dinners. However, waitress never returned to check on us for 30 minutes. No, how's your food or water refills. No bread was ever delivered. She was no where to be seen. Finally saw her and caught her attention, we asked about our dinners, she said they had a large party and kitchen was backed up. No offer to bring bread or refill waters. We had to ask for water refill. Finally dinners were delivered so late at this point. All that time to wait for a bowl of fettuccini and angel hair pasta. Food was okay, fettuccini very bland. Angel hair was good. Almost 2 hours later we were ready to go. Overheard the couple behind us cancel their dinners because it was taking too long and asked for check for their appetizers and drinks. So it wasn't just us. I understand when a kitchen gets backed up, but I expect the service to not end. Check in with us and let us know whats going on, bring bread, refill the water. Just don't ignore us and hope we don't notice. Needless to say we will not be back. Sorry Nicolosi's we tried. We are regulars and were disappointed with our server. Walked by multiple times without greeting us. She was very short with us almost annoyed that we came in for dinner. It was just disappointing from a service standpoint. The food was however excellent and friendly host staff. Made a reservation on Open Table, come to find out when arriving at the restaurant that Open Table reservations do not go/show up at the restaurant. I was told that it goes to the owner??? What good is that when I show up at the restaurant and they have no record of my reservation!!!! Love the service and ambience and the food was amazing!!! They put all diners into one area until they had to expand to the other side of the room. The conversations from the two tables by us were inescapable. Our waitress Roxanne bordered on abrupt. The sweet marinara, as it’s described in the menu, is in fact, noticeably sweet. Staff said they don’t get or see the open table reservations - the boss checks them later. Doesn’t that make a reservation pretty useless? Mistakenly thought the Groupon was good for the lunch specials. But that was all right, We ordered a meat lover's pizza to go. The lasagna lunch special was just ok, but the pizza was fabulous. It was loaded with meat. Delicious! Will definitely go back there for pizza. We've eaten here before, but this was a bad experience. The service was absolutely terrible. The waitress did comp us the wine, but because of such a negative experience we do not plan to return. Never understood what the hostess was trying to tell us about Open Table, but we never got the 100 points although she said we would.